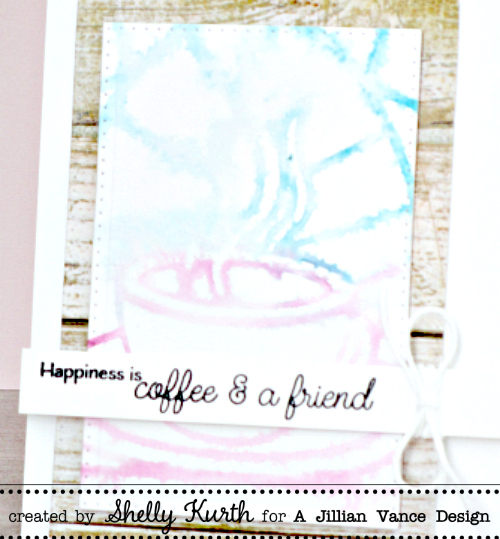 Today I have a sweet coffee card to share, using the new Cup of Love stamp! Also, today is the start of the Coffee Lover's Summer blog hop! Yay! Once my image was dried, I used one of the Polka Dot Rectangle dies with it. Then I used another one of the dies with my background paper, as well. After, I assembled my card together. I kept things fairly clean and decided I'd top things off with a little twine. Don't forget to swing by the Coffee Lover's Summer blog hop for some fun and inspiration!! Shelly! I love your pretty card...soooo dreamy! Thanks to AJVD for being a Super Sponsor...we truly appreciate you! I have to say this is one of my favorite die and stamp sets. I lobe the stainglass look. Thank you fir being a super sponser!!!! Thanks for being a super sponsor! Love your dreamy water color card. What a very cool card, Miss Lady!! Thanks for being a super sponsor....woot woot!!! So very pretty, Shelly! Thanks for being a sponsor this hop and enjoy! What a beautiful card. I love the water-coloring. Great work. So pretty! Love your watercolor treatment... just beautiful... dreamy! Thanks for being a sponsor! Beautiful thanks for being a sponsor! Thanks for being a super sponsor! Love the soft and sweet coffee card! Wonderful card! Thanks for being a super sponsor. Thank you for sponsoring the Coffee Lover's blog hop. This is pretty. Cool stamp set and I love your beautiful creation in soft colors! Thanks for being super sponsor! What a fantastic card with watercolor technique! Love the watercolors. Thanks for being a sponsor! Such a LOVELY card!! Thanks so very much for being a Super Sponsor!! Love the colors and the summery feel of your beautiful card! Beautiful card and thanks for being such a great sponsor. That is just dreamy!! Thanks so much for sponsoring the hop! thank you for sponsoring. I was just playing with my distress inks and misting them all up for a watery look. very cool with your images! Your card is lovely! Love how it turned out. <3 Thanks for sponsoring the hop. A wonderfull card, love the look of the coffeecup and the stream with tteh watercolour look. Such soft pretty colors! Lovely! Wonderful card...love those beautiful soft colors. Very pretty with the soft summery colors. awesome in those soft colors! Thanks for being a super sponsor! Gorgeous card! Love the background paper too! Thanks for being a super sponsor. Love that you decided to watercolor. Terrific card! Thank you for your sponsorship!! So soft and lovely! Thanks for being a sponsor! Thanks to AJVD for being a super sponsor. Watercolors for summer is a great idea! I love that watercolored stamped image! So cool! This is so light and airy! It's like a coffee dream! Thanks for being a super sponsor too! I love the soft colors of your design. So pretty. Love the watercoloring effect you have on your background...very pretty. Love that stamp set have seen several cards using this. Thank you so much for being a super sponsor. Like the watercoloring. I need to practice watercoloring more to improve. Have a Bee-utiful day! Lovely card, Shelly! Thank you so much for being a sponsor! Wow!! Love the effect! Light and airy like a summer breeze! Fantastic card! There's nothing better than a cup of coffee with a friend! Very summery! Thanks for being a sponsor. Sweet! Love the stained glass look of that stamp. Thanks so much for sponsoring the hop!! This stamp set is amazing!!! This is so soft, summery, and super amazing! Thanks for the inspiration and for being a sponsor for this super fun blog hop! Pretty card. Love the soft colors. Thanks for being a sponsor! Thanks so much for being a Súper Sponsor. What an awesome card. Thank you for sharing. Awesome card!! I love the watercoloring!!! SWEET sentiment and PRETTY card!!! LOVE your watercolour stamping, it has a hot & steamy effect, just like the hot cuppa by my side!!! Love the soft pastel colors! Very pretty with the watercolor look. Wonderful colors on your card!!! Thank you for being a sponsor of the hop! Beautiful watercoloring! Thank you for sponsoring this wonderful hop! Pretty card; love that bg paper! I have a few sheets of plank paper I tend to hoard, lol! Thank you for being a super sponsor! Your card is gorgeous! Thank you so much for being a Super Sponsor! This is a fun and inspirational hop!